Conjugal violence is a universal problem that can affect anyone regardless of their gender, economic status, ethnicity or religious affiliation. In international law, there are numerous conventions and treaties on the protection of women against conjugal violence. Also, many countries have enacted legislation protecting women against such abuse. In Canada, conjugal violence is not tolerated. In fact, the Canadian government has criminalized various acts in relationships where conjugal violence is present. Therefore, regardless of the laws present in your country of origin, once you come to Canada, it is the law of this country that applies to you. According to the Criminal Code, sexual abuse can include sexual touching or sexual activity without the consent of the other person, continued sexual contact when asked to stop, forcing a person to engage in unsafe or humiliating acts. Remember that in Canada a spouse cannot be forced to have sexual relations (article 278). A persons refusal to engage in a sexual act can be expressed either verbally (by saying no) or through a non verbal sign of objection to the act. All sexual contact with anyone without their consent is considered a crime in Canada and can be found in the Criminal Code under “Sexual Assault“(articles 271 ss). Although most forms of emotional abuse are not considered crimes in Canada, their presence can indicate that the violence might get worse. Criminal harassment (stalking) which involves repeatedly contacting a person or following them is a crime in Canada and can be found under article 264. Financial abuse happens when someone uses the money or property of another in an effort to control or exploit them. It can also be pressuring someone to sign documents they don’t want to or forcing them to sell their belongings or changing a will. Therefore, most forms of financial abuse are considered a crime in Canada; including theft (article 322), robbery (article 343) and fraud (article 341). Although not all forms of neglect are considered a crime in Canada, article 215.1b) stipulates that failure for a parent to provide the necessities of life to their dependent child as well as child abandonment are considered crimes in Canada. Also, it is important to remember that there are special laws intended on protecting children from these types of abuse. If a parent is suspected of one or more of these forms of abuse, the Department of Youth Protection could intervene in the best interest of the child so as to protect them. Finally, according to the law, a person who feels like they have been a victim of one or more of these crimes can press charges against their abuser. Also, if a police officer is called to intervene in a domestic dispute, they can decide to press charges as well. It is important to remember that in the situation where charges are laid against the abuser, it is the state (government) charging them and therefore as a victim you become their primary witness in the case. The process of testifying can be a long and tedious one, therefore in the following section we intend to provide you information about this procedure. When a criminal act has been committed, the victim or the police department can press charges against the abuser. It is important to remember that if you decided to press charges, it is nothing to feel guilty about. You were a victim of a crime and by choosing to press charges; you were simply protecting yourself and or your children. What is the difference between the court procedures in a civil vs. a criminal case? Once a civil conflict has arisen, for instance during a divorce procedure, it is suggested you speak with a lawyer who will represent you in court and help you prepare all the documentation you will need. You can also speak to a social worker who will support you emotionally throughout this process. Once a complaint has been made to the police, it is up to the criminal investigator to decide if your case shall be passed along to the prosecutor. The prosecutor has the power to decide whether or not to pursue your aggressor. If your case does go to trial, you will automatically become the primary witness in this case. However, you will have the choice to decide whether or not you wish to testify. If you chose to testify, you will need to do so in the courthouse. Once your case has reached this stage, the power to retract your initial complaint is impossible. Once the prosecutor has chosen to pursue your aggressor, the case is completely out of your hands. This is because Canadian society does not tolerate conjugal violence. Who does what at court? The judge is the person who will take and impose the final decision. Before rendering the judgment, the judge will hear both parties, take into account all the facts, and apply the law.
! : Bear in mind that the judge will not evaluate a conduct according to moral standards but will rather appreciate its conformity to the law. Nobody at the court, even the judge, is there to determine that an attitude was wrong or right, but only whether it was illegal or legal. 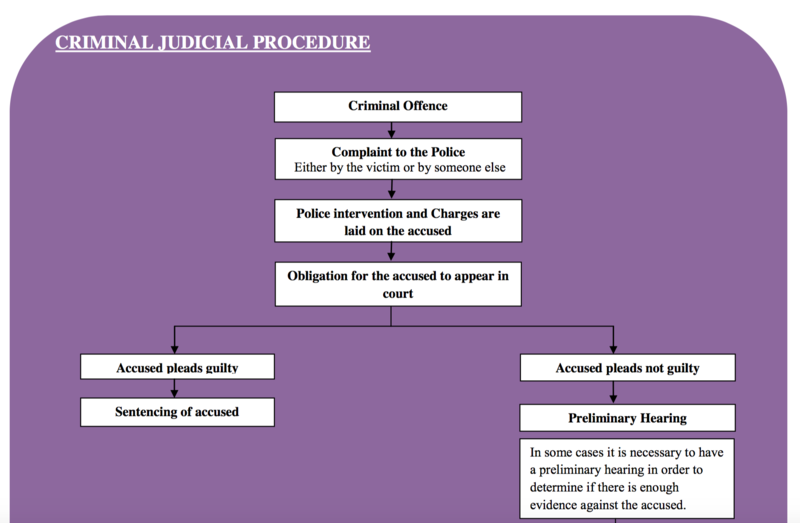 What does the crown prosecutors do? The crown prosecutors represent the state. This means that they will be sitting on the side of the victim but they are not representing the victim’s interests. Their role of the prosecutor is to make sure that the accused gets convicted, but since there are laws to protect the basic rights of the accused, they also have to make sure that these rights are respected during the trial. What does the defense lawyers do? The defense lawyers represent the accused and therefore will try to prove that the accused is innocent, or, if they are found to be guilty because of overwhelming evidence, to reduce the sentence as much as possible. What does the witnesses do? It is the victim of the abuser that usually becomes the primary witness of the prosecutor. The witnesses are called to the stand to say and explain what they felt directly with their 5 senses (ex: witnesses can say “I heard a man shouting” because they heard him directly and not “that person told me she heard a man shouting”). A witness is neutral and is only required to say the truth to bring light on certain events. What does the security officer of the court do? The security officer’s role is to ensure security during the trial. He can prevent unauthorized people from entering the courtroom or intervene if the accused becomes aggressive. The jury is composed of citizens randomly chosen from the population in order to ensure that the conviction is a societal decision (reflects societal values). They are present during the whole trial, and after hearing both parties will decide if the accused is guilty or innocent. 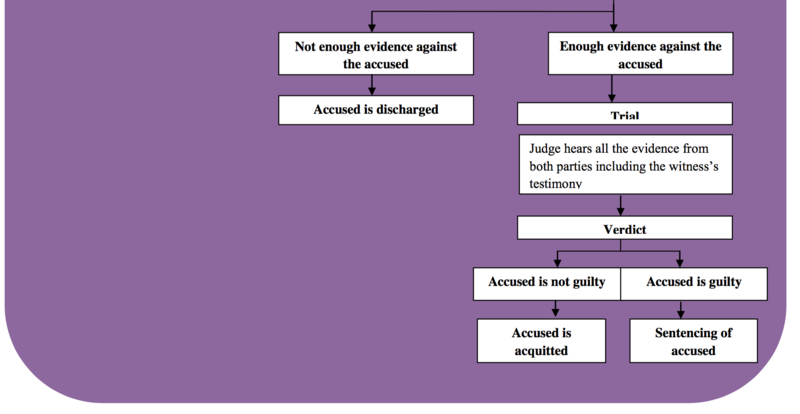 If the accused is found guilty, the judge will then decide the sentence. What does the accused do? The accused is present during the whole trial. They have a right to silence and testifying is therefore not mandatory for them. If they decide that they want to testify, they will only do so when the judge asks them to. What is the importance of testifying? If you have been summoned (received a subpoena) by the court, testifying becomes mandatory. However, if you have not received a subpoena, you could choose whether or not you want to testify. It is important to remember that testifying in court is a way for you to empower yourself. Also, in the situation where you are testifying against an aggressor, it is a way for you to regaining some of the power your aggressor took away from you and shows them that what they did was NOT right! What is important to keep in mind while testifying? When you testify in court, you are bound to say the truth under a formal oath. If you lie on the stand, you are committing what is called in legal terms perjury. This implies that by not telling the truth, you could be held in contempt of court (subject to a fine or prison time). What happens if you are asked a question that you do not remember the answer to? First off, if this happens you have nothing to feel nervous about. Just tell the judge that you do not remember the answer to that question and if the lawyer could please pass to the next one. You are asked an embarrassing question? Remember that no one in the courtroom is there to judge or embarrass you. The purpose of answering more embarrassing questions is just so that the judges can have a more detailed picture of what happened to you so that they can better assess the situation in order to render a judgement. You are asked a question you do not understand? Feel free to ask the lawyer to repeat and-or explain the question. Remember that there is no shame in not understanding a question, especially when you are not familiar with the Canadian legal terms. You are asked multiple questions at a time? You can always ask the lawyer to break down the question into shorter questions that you will answer individually. It is important to take the time to think before you answer and to be as precise as possible. What happens when you are done testifying? After you are done testifying, the procedures will go on until the end of the trial. The judge will then take time to write the judgment keeping in mind everything they will have heard during the trial. Testifying is therefore very important to get the chance to prove your point and to make an impression on the judge. It is also an empowering experience during which you personally get the opportunity to show how unacceptable your aggressor’s actions were.